Brussel sprouts might be the most bullied vegtable on the planet! Its really not their fault though it all comes down to how they are cared for and boiling them for ages is definitely not giving them a chance to shine. So love them or loathe them we reckon our way of roasting them with our Newgrange Gold Chilli & Garlic Rapeseed Oil will make you two best friends in no time. Its pretty amazing how by just simply roasting them instead can help to bring out their delicious nutty flavour hiding inside, adding a nice crispy element to them too. Rapeseed Oil can reach a higher temperature than other types of oils which helps these Brussel Sprouts to caramelise quickly without overcooking them. By sprinkling them with fried chilli and garlic at the end, you are adding ‘va-va-voom’ so that they don’t get lost in the crowd of sides on your Christmas table this year. Cut the ends off the Brussel sprouts and remove any outer leaves that are yellow or brown. Mix them together in a bowl with half the Newgrange Gold Chilli & Garlic Rapeseed Oil and a pinch of salt and pepper. Place into a baking tray and roast in the oven for 30-35min, until crisp on the outside and soft enough inside to get a small knife through them easily. Ensuring to remember to shake the pan halfway through the cooking time to help them cook evenly. While your Brussel sprouts are cooking ad the rest of the Newgrange Gold Chilli & Garlic Rapeseed Oil to a pan, allow to heat up but not smoking, test by placing one of the garlic slices in it and when it starts to bubble slightly around the edges then its ready. Add the rest of the garlic and chilli slices to the oil and fry until lightly golden brown, then remove and place on a piece of kitchen towel to remove any excess oil. 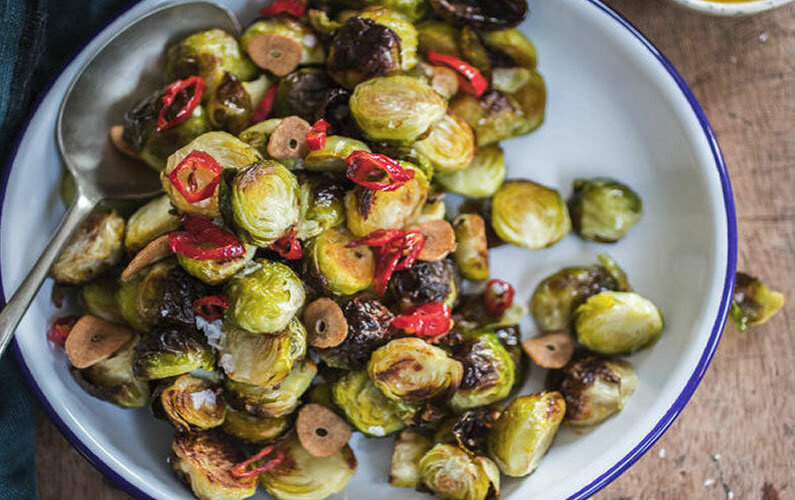 Once your Brussel sprouts are cooked place on a serving dish and sprinkle with the fried garlic and chilli pieces.